The meme of Muslim “no-go zones” spread beyond Fox News Monday during a speech by Louisiana Governor Bobby Jindal in London, and British CNN reporter Max Foster later confronted him over his facts. “But you need to have proper, sort of, facts to back that up,” Foster said to the governor after Jindal repeated a now-discredited claim of “no-go” zones for non-Muslims during a speech to London-based think tank the Henry Jackson Society. 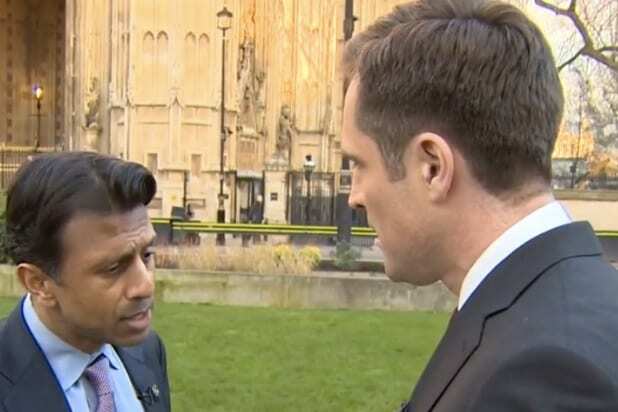 Jindal countered that he used the phrase “supposed” no-go zones, and he’d heard from various people in London that certain neighborhoods are indeed inhabited only by Muslims. He also claimed there are neighborhoods in London where women won’t enter without wearing veils and police tend not to patrol. “You need to give me the area, so we can look at it, because I haven’t heard of one,” Foster pushed back again. Jindal then pivoted, suggesting he meant neighborhoods with high crime rates rather than those neighborhoods being places where non-Muslims don’t go. The “no-go zones” meme was born over a week ago when a guest on Fox News — terrorism analyst Steve Emerson — told host Jeanine Pirro that cities like Birmingham, England, are exclusively Muslim with non-Muslims never entering. Watch the exchange between Foster and Governor Jindal below.